The handicraft of making silk flowers is an ancient art originated in China's Tang Dynasty more than 1300 years ago. In the beginning it was a luxury item for royalties and aristocrats, but gradually disseminated to the general public where ethnic, cultural, custom, religious, regional,and artistic differences all played a role in the evolution and development of style, design, and assembling methods of these artificial flowers. In 1859, two brothers started a handicraft workshop, naming it Kingtei. Their silk flowers were so exquisite they became a favorite of the royalties. At their peak, all their products were taken up by the court. For many decades that followed, the family business flourished and expanded, while the fame of their art spread far and wide. Wars and economic turmoil inflicted a heavy toll on Kingteis business as consumer-spending dried up. Kingtei was forced into suspending their business. China's economic recovery in the 1980's gave the present generation of Kingtei the chance of restarting their ancestor's business. With the cooperative effort of dozens of workers and artisans, Kingtei is regaining its market share and exporting its products to countries such as Singapore, Japan, India, Russia, the United States and the United Kingdom. May first suggestion cleaning silk flowers is the old way. Sponge and water with a little soap. Start from one petal/leaf because you want to make sure that the color will not run. Usually it does not, even though I encountered a few that did. When dealing with cleaning medium to large artificial trees with thousands of leaves, requires a little more time. My experience is that artificial flowers are often overlooked because supposedly they do not need care. Well I can tell you they love a "bath" once in a while. The new way to clean silk flower is a special cleaner in a spray can which I have used often and sell to my clients. It is especially formulated for cleaning artificial flowers and create some "protective" layer not to attract to much dust. Cleaning real flowers, dried or preserved,is different. I suggest a blow drier first. Preserved roses will run the color if you water them. Find a local florist who can give you further advice. SILK: Referred to artificially created botanical products to resemble real fresh flowers. Very few are actually silk. PAPER: I have seen beautiful paper flowers from Thailand. LATEX: The latest innovation is flowers made from molds. The most realistic to fresh ones. DRIED: Referred to natural flowers dried simply hanging them up or with special dehydration chambers. (flowers shrink 50%). By the way, I experimented with cat litter products and the microwave. I destroyed more then successfully dried. Let's say I fried a lot of flowers. DO SILK FLOWERS LAST FOR EVER? Potentially, Yes! Realistically, they go through an aging process and they will not look as good as the first day. 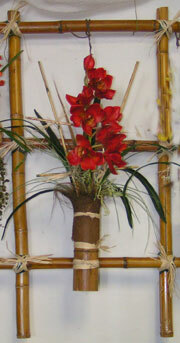 We do replace constantly silk flower arrangements which are a few years old. Flower Styles and colors change with the time, and chance is that you will want something new to look at.